Originally published April 4, 2013. 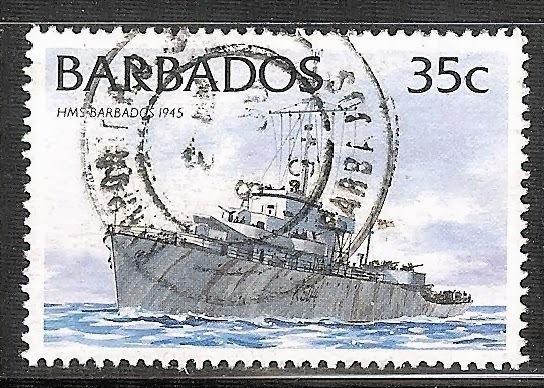 The Barbados issued the 35 cent HMS Barbados stamp on August 16th, 1994 as one of a set of fourteen ships stamps issued. Originally ordered as a patrol gunboat by the US Navy as the USS Halsted, she was reclassified as a patrol frigate of the Tacoma class and laid down in May 1943 at the Walsh-Kaiser Company of Providence, Rhode Island. The ship was renamed HMS Barbados once it was intended to be transferred to the Royal Navy as a Colony class frigate. Launched on the 27th of August, 1943 she was officially transferred to the Royal Navy under a lend-lease agreement in December 1943. The Barbados displacement was 1,190 tonnes with a length overall of 303 feet 11 inches. She had a beam of 37 feet 6 inches wide and a draft of 13 feet 8 inches (how deep She sat in the water). Her three boilers powered her 2, 5500 shp turbines and shafts to a speed of 20 knots. She was armed with Three 3″/50 calibre dual purpose gun mounts, two twin 40mm gun mounts, nine 20mm guns, one Hedgehog depth charge projector, eight Y-gun depth charge projectors and two depth charge racks. The Barbados had a complement of 190 sailors and officers. During her service with the Royal Navy, the Barbados had two commanding officers: Lieutenant Commander Erik George Donald, RNVR and Lieutenant Arthur Horace Kent, DSC, RD, RNR. In April 1946 the Barbados was returned to the US Navy and in 1947 she was sold for scrapping.